• Shake and watch in delight the swirling snowflakes. • Each split apart to hold two trimmed photos. • Insert your trimmed photos through the base. • Accepts one or two photos 1-3/4''x 2-3/4''. Please Note, Snow Globes CANNOT ship during very cold weather in the USA. If in doubt, call us TOLL-FREE 800-558-0114! 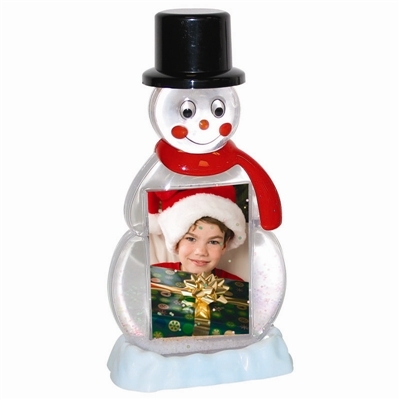 Distinctive Snowman Photo Snow Globes capture the holiday spirit. Shake and watch in delight the swirling snowflakes. Each split apart to hold two 1-3/4''x 2-3/4'' photos.